The palace was built in 1740 by Van Heuts above ground area of ​​25 hectares. 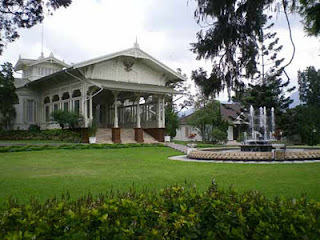 Cipanas Presidential Palace, better known as Cipanas Palace is located at the foot of Mount Gede, 103 km from Jakarta to Bandung direction, or 17 miles from the city of Cianjur. Although not used, the Palace Cipanas remained well preserved. Scenery around the palace is overgrown vegetables, fruits and ornamental plants give a sense of beautiful. Magnificent palace built in 1740 can be visited by the public with special permission from the Secretary of State. Cipanas Palace complex stands on a land area of ​​26 acres, consisting of the main building and seven pavilions, equipped with sports facilities. Stage the main building is a building area of ​​950 m2, comprising several rooms. Situated at an altitude of 1,100 meters, as far as the eye could see looks of vegetables, fruits, ornamental plants and perennials that are laid out in a small forest. Each room is filled device furniture, Jepara carving and a collection of paintings by the masters, such as Basuki Abdullah, Dullah, Sudjojono and Lee Man Kong. While the pavilion buildings are each given the name of puppet characters. Some of the new pavilion was completed in 1916 and there are two new built in 1984. the whole building looks so luxurious and artistic. In the back of the palace there is a fountain diameter 27 m.